Allow fresh air into your home by automatically opening and closing the windows, at just the right moments. fenestra can improve your health by bringing fresh air into your home as well as decrease the use of your A/C which helps lower your energy bills. fenestra is the first and only smart window technology which solves indoor air quality (IAQ) problems in a truly eco-friendly way. fenestra motorizes your sliding windows and allows them to open and close automatically based on your preferences and needs. Studies by the EPA show that air inside your home is on average 10x more polluted than the air outdoors. FACT: Asthma, allergies and sinusitis worsen in response to exposure to indoor airborne allergens and other contaminants. 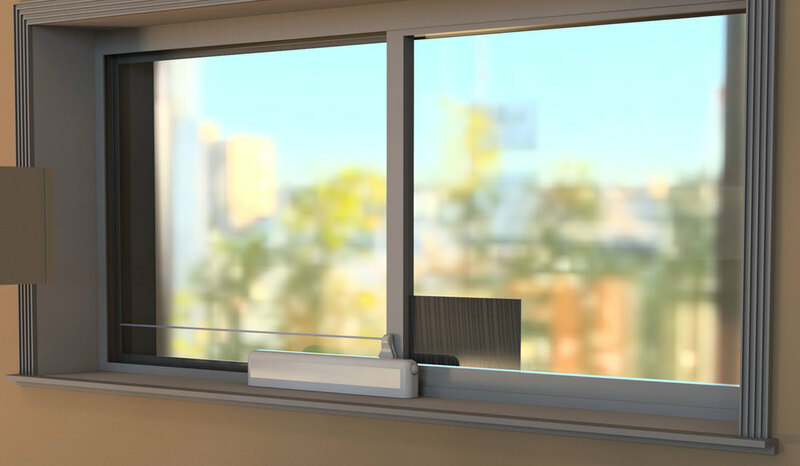 fenestra is a device which motorizes your sliding windows and allows them to open and close automatically based on your desired temperature, your local weather forecast, or a schedule which you set in your phone. By automatically opening and closing the windows in your home at precisely the right time, fresh air from the outdoors can circulate seamlessly through your home, flushing out dirty, stuffy and stale air in the process. Not only that, the increased air flow allows you to decrease the use of your A/C which helps lower your energy bills. fenestra is a zero net energy device. Power is provided via a small solar panel which can be placed directly on your window. fenestra is secured at the base of your horizontal sliding window using a high technology 3M® adhesive but do not worry, it can be removed at any time and leaves no trace behind. Armed with a motion sensor, a siren alarm and mobile notifications, fenestra can react and close your windows in an instant. During the night or when you are not home, fenestra can open your windows just an inch to only let air in while keeping you and your family safe. ©2018 fenestra LLC. ALL RIGHTS RESERVED.